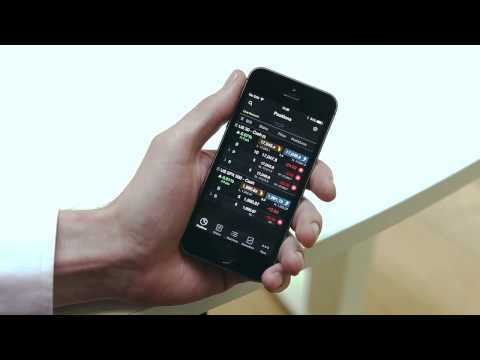 Learn about all the features and tools as your disposal with our award-winning spread betting mobile app*. *Awarded Best Platform Features, Best Mobile Phone/Tablet App, ranked highest for Charting and Spreads, based on highest user satisfaction among spread betters, CFD and FX traders, Investment Trends 2018 UK Leverage Trading Report. When you first log on to the iPhone app, you'll be presented with a popular products watchlist. This watchlist contains a selection of our most popular products, their daily price performance, their daily low and high values, plus their real-time spreads and live pricing. You can launch an order ticket by tapping the buy or sell price for the product. When you enter an amount, your total exposure and margin requirement will be displayed. It's also possible to switch between market, limit and stop-entry orders here. Attach risk management to your orders by tapping the stop loss and take profit bars. These levels can be set by price, approximate amount, or points distance away from the market price. You can also choose between regular or trailing stop losses. When you're ready to execute your trade, just tap 'Confirm'. The first tab at the bottom-left of the screen allows you to view and modify your existing open positions. You can see if you've bought or sold, your average entry price and your real-time profit or loss. You can close out your trades during market hours by clicking on the red cross icon. This section here allows you to see the current value of your trading account, how much money is being used as margin for your open positions, and how much you have available to open new positions. You can hide these details by tapping here. You can see any pending orders here. Access your watchlist containing your favourite products here. And remember that any chart opened from a watchlist will have saved any previous technical analysis conducted on that chart. You can tap 'Executions' to get detailed information about all your recent trade executions. This is useful when reviewing profit or loss per executed trade. The 'More' section is your gateway to additional platform features such as payments, history, the product library, price alerts, Reuters news, CMC 'Insights', the market calendar and more. The product library allows you to search for individual products or you can filter by asset class, country and even price performance and volatility. You can access the product library anywhere in the platform where you see this icon. When you've found a product you're interested in, you can access a wealth of trading information by tapping here. The 'Product Overview' gives you details such as the real-time spread, margin requirements and trading hours. Client sentiment shows you how other traders are positioned for the product you're interested in. You can bring up product -specific Reuters news here, and you can access advanced charting here, to conduct your technical analysis and look for trade set ups.